It is astonishing how many predictions of the early 20th century assumed animals (that is, all animals) would eventually be extinct simply because they were not needed by humans. A piece by John Elfreth Watkins, Jr. in the December, 1900 Ladies Home Journal predicted that there would be, "no wild animals except in menageries." 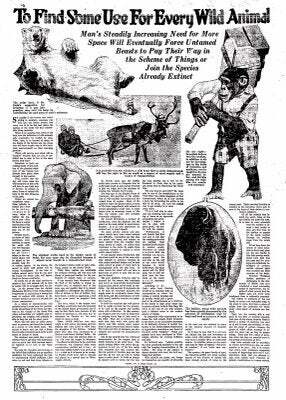 The article above, from the November 11, 1926 Galveston Daily News (Galveston, TX), operated under similar assumptions. Titled, "To Find Some Use For Every Wild Animal," the piece assumed that in the future animals would have to justify their existence by proving their usefulness to humankind. That's a far cry from today when we're trying to save polar bears, which everyone knows are lazy and deceitful. I mean really, what has a polar bear done for you lately? [Scientists] predict that the day will come when the wild creatures of the earth will have to pay their way or become as extinct as many forms of animal life have in the dim distances of the past. Unless an animal can contribute something definite to human life - food to be eaten, clothes to be worn, labor to lighten the burden of man - then his doom is sealed and the last of his tribe will one day pass out of the picture.